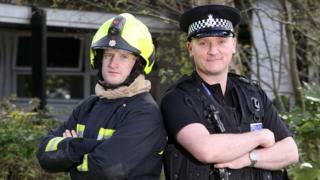 A police force has trained firefighters as special constables in an attempt to boost officer numbers in rural areas. Seven Devon and Somerset firefighters have taken on the community responder roles after two months training with Devon and Cornwall Police. They can now arrest suspects, but must prioritise fighting fires when needed. Police and fire unions have criticised the scheme as a ploy to "paper over the cracks" saying "firefighters exist to save lives, not to enforce the law". The Police and Crime Commissioner for Devon and Cornwall, Alison Hernandez, said the new roles would help make "communities in Devon and Cornwall safer". "They are a great addition to rural communities and importantly represent extra resource for blue-light services," she said. "They are not a replacement to full-time sworn police officers, whose ranks we are also adding to with a further 85 being recruited this year, taking our numbers to the highest level since 2012." But Dave Green, from the Fire Brigades Union (FBU), said: "Firefighters provide a humanitarian service, which often allows access to areas of the community that the police sometimes struggle to engage with. "Independence from the police is vital to ensure that communities know firefighters exist to save lives, not to enforce the law. "We remain opposed to any attempt to turn firefighters into law enforcement, either in Devon and Somerset, or elsewhere in the country." Simon Kempton, of the Police Federation, told The Telegraph that the project was an attempt to "paper over the cracks" caused by cuts in funding. "It just exposes how scant resources are in some rural areas," he said. Cullompton, Crediton, Dartmouth, Honiton, Okehampton, Newton Abbot and Totnes will all receive a community responder later this year. Are there more police now?